Ahoy - Mac's Web Log - The Birthday of Captain Arthur Phillip Royal Navy. 11th. of October 2005. The text of a presentation I made last night to the Australia Day Council members in Melbourne. See "Settlement of Australia. The First Fleet. 1787-1788 "
The Birthday of Captain Arthur Phillip Royal Navy. 11th. of October 2005. RAN. R'td. to The Australia Day Council and members at Graduate House, Melbourne. Mr Chairman, members of the Australia Day Council, ladies and gentlemen, thank you for your welcome. Today we meet to celebrate the birthday of Captain Arthur Phillip RN, the founder of the colony of NSW. He was born on this day back in 1738 in Bread Street London, so named as it was the location of the bread market, Arthur Phillip's father was a native of Frankfurt Germany, his mother, her maiden name Elizabeth Branch, had previously been married to Captain Herbert RN, and when their son later chose a career at sea perhaps his Mother's earlier marriage influenced him. Arthur went to Greenwich School associated with the famous Greenwich Hospital at age 12 3/4 on the 2nd. of June 1751. He left, when only 15 and 2 months to be bound as an apprentice, for 7 years, to Captain Readhead of the ship Fortune, she was only of 210 tons burden, and traded to Greenland. Thus the future Governor of NSW began his sea career. In 1755, Phillip was released from his indentures and joined the Royal Navy, and a 68 gun ship HMS Bonaventure, as the Captain's servant. He only held this post for a month before being reentered as an Able Seaman. After serving in several ships he stood on the bottom rung of the Officer's ladder as a humble Midshipman, once described as the" Lowest form of animal life in the Navy." At age 22 Phillip served in HMS Dublin as a Lieutenant in 1761, by April of 1763 he was unemployed and went onto half pay. Arthur Phillip entered into his first marriage to a widow, Margaret Denison on the 19th. of July 1763, little is written about this union, but it seems to have finished about 1774. Over the 12 year period of 1763/1775 there is a dearth of material available about Phillip. He now joined the Navy of Portugal as a Second Captain on the 14th. of January in 1775, but soon had his own command of the Frigate Pilar, going off to Rio de Janiro in South America. By all accounts he served his new Navy with distinction until the 18th. of September 1778. Back in the Royal Navy, but still listed as a Lieutenant, he joined HMS Alexander as her First Lieutenant, now on the 2nd. 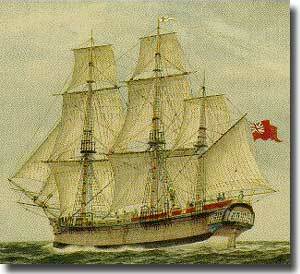 of September of 1779, Phillip achieved his first command in the RN, HMS Basilisk, to pay her off the following July. After 18 months of idleness, at last, on the 30th. of November 1781 Arthur Phillip was raised to a Post Captain, and command of the 24 gun vessel, HMS Ariadne. Just over a year later he assumed command of the 64 gun Europa, until paying her off in May 1784. Captain of Sirius and Governor Elect of NSW. Phillip had over two years on half pay in the rank of Post Captain, then, on the 25th. of October 1786 he was appointed Captain of HMS Sirius, and Governor elect of New South Wales. The numbers of criminals were increasing, and one way of disposing of them was transportation, by 1787-8, they had increased to7,482 of whom over 4,000 might be sent overseas. It may well have been Sir Joseph Banks who first planted the seed of establishing a penal settlement at Botany Bay. How did Captain Arthur Phillip RN. come to be selected as Governor elect of NSW? It is not easy to answer this question, but it does appear that Phillip's selection as the Governor elect for New South Wales may stem from the fact that he was a near neighbour of Sir George Rose, under Secretary to the Treasurer, and afterwards, Treasurer to the Navy. Sir George would know of his Navigational training, and also that Phillip as a gentleman farmer knew about crops, and animal husbandry. It was Lord Palmerston who said " Whenever I want a thing done well in a distant part of the world, when I want a man with a good heart, lots of pluck, and plenty of common sense, I always send for a Captain in the Navy." His Lordship may well have added his approbation to the mix that pulled Arthur Phillip out of relative obscurity to propel him across the world in charge of an outpost of Empire. To leap ahead some time, when in New South Wales, Phillip did remember Sir George Rose, by naming Rosehill, a tract of land, and Rose Bay an attractive area on the southern shores of Port Jackson after him, so perhaps he was beholden to Sir George for his nomination and selection. Prior to the sailing of his Fleet, Phillip spent some months in preparation, and was to exhibit his skill, wisdom, and foresight that would become apparent in his term of control in the new Colony far across the ocean. It was on the 13th. of May in 1787 that Captain Arthur Phillip in Sirius, in the company of the tiny 170 ton King's ship Supply, the transports, Alexander, Lady Penrhyn, Charlotte, Scarborough, Friendship and Prince of Wales, the Store ships Fishburn, Golden Fleece and Borrowdale, led the First Fleet from Portsmouth out to sea, they were on their way at last into the unknown to Botany Bay 12,000 miles distant. At the Cape of Good Hope, Phillip transferred to the Supply, and with the fastest three ships in the Fleet, Alexander, Scarborough, and Friendship, he pressed on ahead of the other ships. Thus after eight months, and one week, on the 18th. of January 1788, Supply let go her anchor in Botany Bay, the other three fast ships arrived the next day, and Sirius led the convoy in on the 20th. a remarkable voyage across the world ended. A report stated that 24 had died en route, although Watkins Tench put that figure at 32, some achievement, given the lack of fresh food, and the time and distance involved from sailing out of Portsmouth. Phillip was unhappy with Botany Bay as a site to found his settlement, and taking three boats he set off northwards, and on the 21st. entered the heads at Port Jackson to record, "They had the satisfaction of finding the finest harbour in the world in which a 1,000 sail of the line may ride in the most perfect security." The 23rd. of January found Phillip back at Botany Bay, on the next day, to everyone's suprise, two sails were sighted off shore, they proved to be French, La Boussole and L'Astrolabe, under the Comte de la Perouse, the British expedition had made it by the skin of their teeth, how very easily we might all be speaking French today! Now on the 25th. Phillip sailed for Port Jackson in Supply, leaving Captain Hunter to follow with the rest of the Fleet. At daylight, on the 26th. of January 1788, the day we now celebrate as the Founding Day of our Nation, Marines and convicts from Supply landed, and at noon the Union Jack was raised, and possession taken for His Majesty, the Fleet were soon all snugly at anchor. Over the next five years, the new Colony in NSW and at Norfolk Island prospered under the fine stewardship of Captain Arthur Phillip. Although he was not to learn of it until after his return to England, the Governor's first wife died on the 6th. of October 1792. When Phillip sailed for home on the 11th. of December of 1792 the settlement, including Norfolk Island had grown to 4,221, with over 1,703 acres under cultivation, or cleared for planting, and land grants to settlers were 3,470 acres, of which some 470 acres were under crops. Major Grose as Lieutenant Governor was left in command at Port Jackson. I was one of twelve 13 year old boys selected to join the Royal Australian Naval College as Cadet Midshipmen in January of 1936 at Flinders Naval Depot. In many ways, my training mirrored that of Phillip so many years earlier. I too had learned Navigation, Seamanship, and Naval Signalling in my almost 4 years at the College. We were taught to be self reliant, to problem solve and make decisions, be persistent, take care of the welfare of our sailors, and learn the fundamentals of leadership. Come August 1939, the four College years were fallen in prior to going on leave, my 4th. year would return to graduate and have our Passing out Parade, usually with His Excellency the Governor General taking the salute.
" Gentlemen, there is going to be a war, you are going to sea to join the Fleet. Remember that leave is a privilege, and not a right." No Graduation, no Passing out Parade. My next 6 years were to be governed by those few words. I then served the whole war at sea or overseas, my four cruisers, Australia, Canberra, to be sunk in her at the Battle of Savo Island on the 9th. of August 1942, and lose 84 shipmates, our American allies lost 3 heavy cruisers and 1,000 sailors in the same battle. Adelaide, and lastly in Shropshire. Winston Churchill organised the RN to gift the ship to the RAN to replace Canberra, many of her survivors went on to crew Shropshire. We marched north in the Pacific to be present in Tokyo Bay for the signing of the Japanese Surrender ( sparked by President Truman's decision to drop two Atomic bombs on the Japanese mainland ) aboard the USS Missouri on the 2nd. of September 1945, all orchestrated by General Douglas MacArthur. What a wonderful day, at last the war was over, I had survived and would be going home. Just last month, my wife Denise and I, were invited by the USS Missouri Memorial Association to be on board the Mighty Mo at Pearl Harbor, for the 60th. Anniversary of the original signing, another great event. I am indeed proud of serving for almost 20 years in the Royal Australian Navy, and today, close to 50 years later, I am still applying lessons I learned in the Navy so long ago. One can take the man out of the Navy, but I guess its quite difficult to take the Navy out of the man! Phillip returns to the Royal Navy. After his arrival in England, Phillip returned to his old love the RN, he lobbied for King to be the next Governor in NSW, but Hunter was appointed to succeed him. He continued to advance in the RN, promoted to Rear Admiral of the Red in 1805, Vice Admiral of the White in 1809, and in 1814 in June to Admiral of the Blue. At age 77, Phillip died on the 31st. of August 1814. "Arthur Phillip well and truly laid the foundation stone of the Commonwealth of Australia, setting up the rough ashlar, which time and energy have chiselled, and polished into a noble and enduring edifice." My thanks for your patience and attention. The Naval Heirarchy in Arthur Phillip's time. The naval squadrons were ranked in order Red, White and Blue and then the Admirals ranked in accordance with their squadron. Vice Admiral of the Red. Vice Admiral of the White. Vice Admiral of the Blue. Rear Admiral of the Red. Rear Admiral of the White. Rear Admiral of the Blue. So, the final promotion of Arthur Phillip in June of 1814 to Admiral of the Blue, at that time placed him at Number four in the Royal Navy, quite an honour.